Dlouhá třída is the street where Firma Polák, trading in oil and varnish, were located. Švejk bought oil consecrated by a bishop: Hempseed oil No. 3. Dlouhá třída is a street in Staré Město (Old Town), Prague. It extends from Staroměstské náměstí towards Poříčí and is one of the oldest streets in the city. [1.13] V druhé chtěli telefonovat na ochrannou stanici a ve třetí mu řekl provisor, že firma Polák v Dlouhé třídě, obchod olejem a laky, bude mít rozhodně žádaný olej na skladě. Jeronýmova 324/8 (2010). This is where the first part of the novel was written in 1921. Žižkov is here mentioned in an anecdote about a priest, but the district appears several times throughout the novel without the plot ever being explicitly set here. Amongst them is the sequence where Švejk ask for the way here and asks the maid of colonel Kraus about the habits of the dog he is planning to steal. The place is also mentioned in connection with Axamit. Žižkov is an urban district and cadastral area east of the centre of Prague. Administratively it is part of Prague 3 and partly Prague 8. The district as named after the Hussite leader Jan Žižka. From 1881 to 1922 it was a city in its own right. Žižkov city counted 72,173 inhabitants in 1913, and all except 1,555 were registered with Czech nationality. It was the centre of okres and hejtmanství of the same name. The first and part of the second volume of Švejk was written here. Jaroslav Hašek stayed with his friend Franta Sauer at Jeronýmova 324/3 from January to August 1921. Nearby at Prokopovo náměstí there is a statue of the author. [1.13] Na Žižkově jednou farář zmlátil jednoho slepýho, že při takovej příležitosti nesmek, a eště byl zavřenej, poněvadž mu u soudu dokázali, že není hluchoněmej, a jenom slepej, a že slyšel cinkot zvonečku a budil pohoršení, ačkoliv to bylo v noci. [I.14] Švejk ji oslovil: „Dovolte, slečno, kudy se jde na Žižkov?“ Zastavila se a podívala se na něho, myslí-li to upřímně, a dobrácký obličej Švejkův jí řekl, že opravdu ten vojáček chce asi jít na Žižkov. Výraz její tváře změkl a ona ochotně mu vykládala, jak na ten Žižkov půjde. [III.2] To je na Žižkově pan profesor Axamit a ten tam kopal, hledal hroby skrčenců a několik jich vybral, a voni si ho, toho flašinetáře, vodtáhly do jedný takový vykopaný mohyly a tam ho dřely a zneužívaly. Malešice is mentoned in an anecdote Švejk uses as a parallell to the persistent money lender. The soldier refers to a landlord who for any occasion can show up with a quote from the Bible. Malešice is an urban district in eastern Prague, located in Prague 10 and Prague 9 respectively. It became part of the capital in 1922. In 1913 Malešice was part of hejtmanství and okres Žižkov. The population counted 1,114 and almost all but five declared themselves as Czechs. Bordeaux is indirectly mentioned by Katz when he suggests to Švejk that they prepare a Bordeaux punch. Bordeaux is a city in south western France with appx. 250,000 inhabitants (the urban area appx. 1 million). Det is centre of the wine growing region of the same name and it is this connection that makes its way into the novel. This variety of punch may not be well known term today, but an internet search reveals a punch based on red wine. Bordeaux is obviously connected to the this very ingredient because the area around this French city is a famous wine growing region. The drink was also on sale in bottles, as adverts bear witness to. The best known was a brand seems to have been E. Lichtwizt & Co from Opava (Troppau) who were also suppliers to the imperial and royal court. Even more common were concentrated flavours in bottles and these are the ones that appear in the earliest adverts. The first mention of Bordeaux-punch that can be traced in the Austrian press is from 1845 and refers to an event at Sofien-Insel in Prague (now Slovanský ostrov). In the handwritten manuscript of Švejk (page 127) Katz uses the term "bordeux-punč". This and some other minor errors were corrected in post-WW2 editions of the novel. [1.13] "Vidíte, Švejku, jak to dopadá s takovým člověkem, který nectí kněze," usmál se polní kurát. "Svatý Jan Zlatoústý řekl: ,Kdo ctí kněze, ctí Krista, kdo příkoří činí knězi, činí příkoří Kristu Pánu, jehož zástupcem právě kněz jest.` - Na zítřek musíme se dokonale připravit. Udělejte smažená vajíčka se šunkou, uvařte Bordeaux punč a potom věnujeme se rozjímání, neboť jak je v modlitbě večerní: ,Odvráceny jsou milostí boží všechny úklady nepřátel o tento příbytek.` "
About the fatal attempt to cross the Drina on 8 September 1914. Source: Böhmerwalds Söhne im Felde. Author: Gustav Jungbauer. Drina is first mentioned by the moneylender who pestered Katz. He complains that lieutenant Janata had been cheeky enough to get killed by the Drina, despite owing him 700 crowns. The river Drina is later mentioned several times, particlularly in Királyhida where veterans relate from the campaign against Serbia in 1914. Drina is a river on the Balkans, and one the tributaries to Sava. Stretching 346 km it is the border between Bosnia­-Hercegovina­ and Serbia, in 1914 effectively the border between Austria-Hungary and Serbia. IR91 and the 9. Infantry Division part of the campaign against Serbia from August to December 1914. Amongst those participating where several of the officers that Jaroslav Hašek used as models for characters in the novel: Rudolf Lukas, Čeněk Sagner, Josef Adamička, and Franz Wenzel (the latter from mid August). As an officer's servant František Strašlipka presumably accompanied Lukas already then. The regiment arrived on Gunja by the Sava on 4 August after a three day train journey from Budějovice. They immediately continued by ship and foot to the assembly area by Bjelina (now Bijeljina), where they arrived the next day. On 12 August they crossed the river on pontoon bridges by Novoselo and took part on the bloody battle of Cer from 16 to 19 August. Suffering heavy losses they withdrew and were back on the Bosnian bank on the river by 20 August. On 8 September 1914 the division took part in another attempt to invade Serbia, during the so-called battle of Drina. This time the point of crossing the Drina was by the confluence with Sava. It ended in disaster, and IR91 lost more than 700 men in dead, wounded and missing. Although initially able to cross on pontoon bridges they were driven back, and in the night they were ordered to retreat across the river. But the bridges had been destroyed, and subjected to devastating Serb fire, panic broke out. Many threw themselves in the river and nearly all of them drowned. They remained on the west bank of the Drina until they on 26 September when they were moved to the northern bank of the Sava. This was the last time they were stationed by this river. The famous reporter Egon Erwin Kisch kept a diary during him time with IR11 in Serbia. His regiment, from Písek, belonged as IR91 to the 9th infantry division and took part in the same battles under the same circumstances. In this moving and well-written book, Schreib das auf Kisch!, the author describes the hardship and sufferings the soldiers were subjected to, about the horrendous losses, about the incompetence at all levels, morally deprived officers, about chaos and confusion, about the false description on the real situation that the people at home were presented. The book contains a lot of descriptions that readers of Švejk will recognise. [1.13] Nadporučík Janata dluhoval mně 700 korun a odvážil se padnout na Drině. Rawa Ruska is mentioned by the persisting money-lender when he complains to the reluctant Katz that captain Wichterle had let himself get killed by his own soldiers despite owing 2000 crowns. Rawa Ruska is the Polish name of Рава-Руська (Rava-Ruska), a town and railway junction in Galicia, near the current border between Ukraine and Poland. The city is administratively part of Lviv oblast, Until 1918 it was part of Austria-Hungary, in the inter-war period it belonged to Polen, since 1945 the Soviet Union and from 1991 Ukraine. Rawa Ruska was during Austria-Hungary rule part of Ergänzungsbezirk Nr. 30 that again belonged to Korpsbezirk Nr. 11 (both Lwów). Soldiers from the area would this have been enrolled in IR30. The fragment from the novel refers to the battle of Rawa Ruska that took place from 6 to 11 September 1914 between the armies of Austria-Hungary and Russia. The outcome was a catastrophic defeat for K.u.k. Heer who were forced to withdraw to a defensive line along the river San and the Carpathians range, and in effect abandon most of Galicia. Hardest hit was Brudermann's third army. The withdrawal started in the early hours of 12 September and on that day Russian forces occupied Rawa Ruska itself. One of the casualties of the battle was Herbert Conrad von Hötzendorf, son of Chief of General Staff, Conrad. The Central Powers were only to return on 21 June 1915 when the town was conquered by German troops. Die Armeen des Generalobersten v. Mackensen kämpfen um Lemberg und Zolkiew; Rawa-Ruska ist in unserer Hand. Westlich Rawa-Ruska wurde der Feind gestern von deutschen Truppen angegriffen und geworfen. [1.13] Hejtman Wichterle, dluhující mně stejný obnos, dal se zabít pod Ruskou Ravou vlastními vojáky. Lage und Verteilung der Kräfte 1. Mai 1915. Österreich-Ungarns letzter Krieg II, Beilage 15. Carpathians is mentioned by the money lender who pestered Katz, because yet another officer who owed him money had been killed there. In the same chapter there is a description of two soldiers dying at Vojenská nemocnice Karlovo náměstí. Both had been shot in the stomach. Carpathians also appears in [I.14] as Lukáš enters the plot. Švejk reads about events there in the paper when he accompanies Katy to the barracks where Lukáš teaches one-year volunteers. Later in the chapter the mountains are mentioned by Lukáš in the conversation with Wendler. From [III.1] the Carpathians and places in the mountains are mentioned frequently by soldiers who have been there with previous march battalions and tell their stories. In [III.4] the plot takes place in the Carpathians. See Łupków Pass. Carpathians is the easternmost of the great mountain ranges of Europe. It extends 1,500 km on the territory of Romania, Czech Republic, Slovakia, Poland, Ukraine, Austria, Serbia and Hungary. In September 1914 Russian forces pushed into the northern part of the mountain range and in early October they tried to break through the Uszok pass. In November they occupied Humenné for a short while and also entered Hungarian territory in Maramaros (now Maramureș in Romania). The winter battle in the Carpathians started in December 1914 and lasted until March 1915. The Uszok pass was captured by the Russians in December and Dukla was also for a long time controlled by the Russian army. A third important spot was Lupkow where fierce fighting took place during the winter. In reaching the Laborec valley Russian forces crossed the Karpatane but never managed to force their way through to the Hungarian plain. K.u.k. Heer attempted several offensives throughout the winter, but the two armies that were involved (2nd and 3rd) were poorly equipped for a winter war and more men froze to death than fell victims of enemy bullets. The Russians also suffered horrendous losses, made worse by the tactic of sending human waves towards the enemy, a tactic the due to machine gun fire ended in mass slaughter. The end of the war in the Carpathians came in early May 1915 after the Central Powers' advance during and after the battle of Gorlice-Tarnów. Under German command the Central Powers forced the Russians away from the mountains. IR91 left the transport trains by Nagy-Berezna 7 February 1915. From "Böhmerwalds Söhne im Felde". IR91 in Jaworzec, March 1915. From Jan Ev. Eybl, © SOkA Beroun. Three battalions (2nd, 3rd and 4th) of IR91 fought in the Carpathians from 7 February 1915 until the first week of May. Thereafter they marched across the mountains and pursued the enemy in the direction of Sambor. IR91 operated within a relatively small area, near the current border triangle between Slovakia, Poland and Ukraine (see Východní Beskydy). Commander of the regiment at the time was Colonel Alfred Steinsberg who 1 February 1915 had been transferred from the sister regiment IR73 who belonged to the same division (9th). During the hard winter the cold was often a bigger problem than the enemy. This is reflected in the anecdotes veterans from the Carpathians tell in the novel. At least four of the real-life models of characters from Švejk served here: Rudolf Lukas, Jan Vaněk, Josef Adamička and Jan Eybl. The former two were wounded in early March and only rejoined the regiment on 11 July with the 12th March Battalion. The more peripheral Wurm also served there, from March 1915. In Jan Eybl's archive valuable photos from this period exists. Most of them are from Jaworzec where IR91 staff was located in March 1915. Eybl's diaries cover the whole period the regiment stayed in the Carpathians. After 2 May 1915 the situation changed. The Central Power's breakthrough victory by Gorlice-Tarnów forced the Russians away from the mountain range and IR91 was among the units that pursued the enemy across the river San and in the direction of Sambor. The regiment marched off from their positions by Kistopolya and Oroszpatak on 4 May, crossed the San a week later and by 15 May they have reached the area by Sambor. In [I.14] there are two near literal quotes from Kronika světové války regarding the Carpathians. These are amongst many snippets from this publication that appear in this part of the novel. The first quote regards Švejk's considerations at the gate of the barracks where he accompanied Katy. Almost word for word identical quotes are found in "Kronika" at page 505. It deals with events on 26 March 1915. The second borrowed quote appears in the conversation between Lukáš and Wendler where the officer states that a breakthrough of the Russian front between middle Dunajec and the ridge of the Carpathians will definitely end the war. The source is Kronika světové války page 508 and refers to events by Dunajec on 2 May 1915, the first day of the Gorlice-Tarnów offensive. [1.13] Ten padne v Karpatech s mou nezaplacenou směnkou, ten jde do zajetí, ten se mně utopí v Srbsku, ten umře v Uhrách ve špitále. [1.13] Po posledním pomazání ve vojenské nemocnici toužili dva. Jeden starý major a jeden bankovní disponent, důstojník v záloze. Oba dostali kulku do břicha v Karpatech a leželi vedle sebe. [1.14.5] Jakmile však prolomíme ruskou frontu mezi karpatským hřbetem a středním Dunajcem, není nijaké pochybnosti, že bude to znamenat konec války. [1.14.5] V karpatských úsecích, jak vidíte, máme velkou oporu. From the book "Českomoravská vysočina", 1909. Vysočina in 2017. View from Lipnice castle. Českomoravská vysočina is mentioned by the author when he describes a group of soldiers with Švejk at the forefront holding a discussion. Then a young soldier from Vysočina who still believed in God entered the discussion. The conversation took place at Vojenská nemocnice Karlovo náměstí. Českomoravská vysočina is a historical term for the geographical area that is now called Českomoravská vrchovina (Bohemian-Moravian Highlands).The area roughly corresponds to the modern administrative region of Kraj Vysočina but is slightly bigger. The administrative centre in the modern Vysočina is Jihlava. The highlands are strongly associated with Jaroslav Hašek, mainly because most of Švejk was written here, more precisely at Lipnice nad Sázavou. This is also where he died and where his grave still is. His descendants have since 2003 been running U české koruny, the inn where the author lived from August 1921 to October 1922. Hašek knew the region well, also from his trips before the war, and mentions several places from from Vysočina in the novel. Apart from Lipnice itself he mentions Posázaví, Německý Brod, Chotěboř, Skuteč	, Okrouhlice, Kejžlice, Jihlava, Pelhřimov, Jedouchov, Dolní Královice, Velké Meziříčí. It should be added that when the author wrote this passage of the novel he had not yet moved to Lipnice nad Sázavou. [1.13] Nějaký mladičký vojáček z Českomoravské vysočiny, který ještě věřil v pánaboha, prosil, aby se o takových věcech nevedly řeči a aby se svatá tajemství nezatahovala do debaty. Musíme křesťansky doufat. Carthage is mentioned by a soldier who is a teacher in civilian life. It concerns how sun spots can cause disasters on earth, as the conquest of Carthage. The conversation took place at the military hospital at Karlovo náměstí (see Vojenská nemocnice Karlovo náměstí). Carthage is mentioned again by Marek, where he in the arrest in Budějovice tells how his complacency led to his demise. Carthage was an ancient city state at the coast of North Africa, south of Lake of Tunis in modern Tunisia. At its prime it is believed to have had up to 700,000 inhabitants. The Phoenician city was an important sea power. The city was destroyed by the Romans after the Punic Wars in 146 BC and this is the event both conversations in the novel refers to. [II.2] Svou zpověď zakončil jednoroční dobrovolník slavnostně: „Došlo i na Karthago, z Ninive udělali zříceniny, milý příteli, ale hlavu vzhůru! Ať si nemyslí, že když mne pošlou na front, že dám jednu ránu. Regimentsraport! Vyloučení ze školy! Saint-Pierre after the eruption in 1902. Mount Pelée and the volcanic eruption here "that time" is the theme in a dialogue at the military hospital (see Vojenská nemocnice Karlovo náměstí) where Švejk and Katz administer the last rites. The conversation circles around sunspots and that a professor had written in Národní politika that he years ago warned that those cause disasters on planet earth. Mount Pelée is a volcano at the north-western part of the French Caribbean island Martinique. It had an explosive eruption on 8 May 1902 that caused an estimated 30,000 casualties. The island's main city, Saint-Pierre, was totally destroyed and only few of the citizens survived. Švejk is however imprecise when he claims that the eruption destroyed the whole island of Martinique. It was mainly Saint-Pierre and the northern part of the island that was hit. Already early in the year activity was observed at the volcano and on 23 April 1902 the eruption started. Early in May the situation was serious, with ash raining down on the surrounding areas. In the morning of 4 May there was an eruption and a mudslide destroyed a sugar factory and 23 people perished. Many had also been killed by poisonous insects and snakes that fled from the area around the volcano. The same day the governor informed the French minister of colonies about the eruption, and the press around the world now reported the event (including Vienna). Then within a few days the great disaster struck. On 8 May at 7:52 in the morning the volcano literally exploded and dispatched a burning cloud of ash and gases in the direction of Saint-Pierre. It took only one minute for the cloud hit the city and killed its people instantaneously, they died by the heat and the shock wave. Everything flammable caught fire and the city was levelled to the ground. The ships anchoring in the harbour were also destroyed. During the summer further eruptions caused destruction and loss of human life. [1.13] Když tenkrát ta sopka Mont-Pellé zničila celý ostrov Martinique, jeden profesor psal v ,Národní politice’, že už dávno upozorňoval čtenáře na vekou skvrnu na slunci. Martinique sunspots and the eruption at Mount Pelée is the theme of the dialogue at the military hospital where Švejk and Katz administer the last rites. Švejk connects the disaster to sunspot activity based on what he had read in Národní politika where a professor wrote that he already had warned about a big sunspot. Martinique is and island in the Small Antilles in the Carribean Sea and a French overseas département. The island is located about 450 north east of the South American coast and 700 km south east of the Dominican Republic. The island is as part of France, member of the EU, and the currency is Euro. The population count in 2014 was around 384,000. The volcanic eruption referred to in the novel happened on 8 May 1902 and was reported in Czech newspapers two days later. 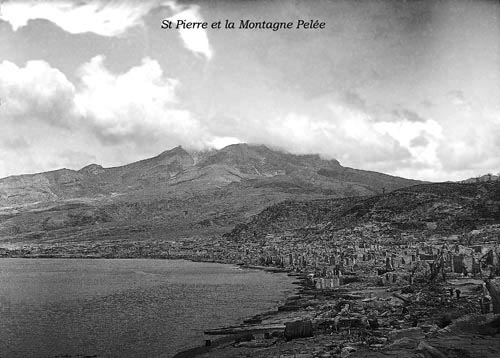 See Mount Pelée for more information about the disaster. The professor that the good soldier refers to was by near certainty Zenger. [1.13] Když tenkrát ta sopka Mont-Pellé zničila celý ostrov Martinique, jeden profesor psal v ,Národní politice’, že už dávno upozorňoval čtenáře na velkou skvrnu na slunci.